It’s #WhatsCookinWednesday and what could be better this summer for your weekend cookout than a cheeseburger, A cheeseburger with goat cheese and Zucchini Fries, that’s what! Enjoy this savory and tangy patty of goodness at your next cookout or tonight for dinner, It doesn’t take long, its simple to prepare and its good for those of you on a Keto eating plan. I use lettuce instead of a bun most of the time, however, occasionally I will use one of the bread recipes in one of the other posts. And as always, i won’t be mad at you if you bring me one! Each serving comes out to be 1151 Calories, 113g Fat, 10g Net Carbs, and 66g Protein. Mix all ingredients for the tomato mayo and set aside in the fridge. Cut the zucchini lengthwise and remove the seeds. Divide into rods, about 1/4 to 1/2 inch thick. Crack the eggs in a bowl and whisk to combine. Mix almond flour, parmesan cheese, onion powder, salt and pepper on a plate. Toss the rods in the flour mixture then dip each in eggs to cover. Finish with another coating of flour. Place the fries on the baking sheet and drizzle olive oil on top. Bake in the oven for 20-25 minutes or until golden brown. In the meantime, prepare the burgers. Start by slicing the onions thinly and saute’ in butter until soft on medium heat. Add the vinegar towards the end, give it a stir and reduce until creamy. Add salt and pepper to taste. Set aside until serving. Shape the burger patties and fry or grill them to your liking. Season with salt and pepper. Place the burgers on beds of lettuce and the onion mixture. Place the goat cheese on top and serve with zucchini fries and spicy tomato mayo. You can use a variety of different veggies (that are low carb) in this recipe. My name is Len Benoit and I’m the owner/trainer at Fit 1 in Toronto/Etobicoke. 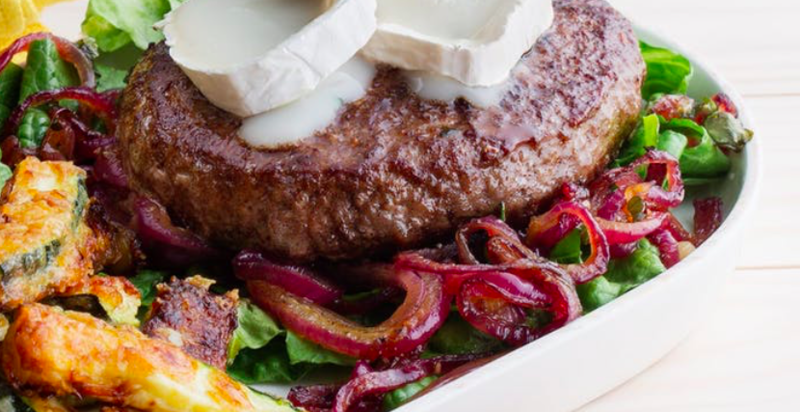 I didn’t invent this delicious #WhatscookinWednesday Goat Cheese Burger with Zucchini Fries recipe, I spied it on dietdoctor.com, but I will enjoy it right along with the rest of you. If you liked this one then there are a lot of delicious recipes just right for you keto journey. Check them out. If you are looking for gyms in Etobicoke or Toronto and want more information about my Women’s and Co-Ed Bootcamp, Youth Sportfit Program, or Personal Training classes, give me a call at 647-776-7776 or visit the website at www.fit1bootcamp.com. Come in for a FREE 7-Day Trial membership if you are friends with one of our members, if not, head on over to the website to learn more about our FREE 1 session mini-session and find out why FIT is right for you!